Staying on top of the paper tsunami! Getting on top of the incoming flood of paper takes getting a great plan and personalized routines into action! Without a doubt, dealing with paper is one of the most overwhelming tasks. Attack it with gusto! This Smead Stadium Sorter is just the tool it takes to combat paper. It is 12 tiered pockets so that you can see all your categories simultaneously. Labels are included, such as by month, or household subject, or you can make your own with your personal categories, including your kids, your partner, receipts, dinner menus, coupons and other common categories of paper. It is a small enough size to fit on the counter, right by your phone. It is large enough to hold up to 900 sheets of paper! Let’s go step by step with this sorter. First decide what your categories should include for your family. I recommend not only the names of your kids and partner, but also Action, File, and Pending. Label the files with the labels included, your sharpie pen or your label maker. Now place this in the spot that you can see it daily, and set it up as a work zone for incoming mail and kids’ papers. Every evening, sort into your sorter. If you miss an evening, try to sort at least twice a week. Once a week, go back into your sorter and have your administrative time. 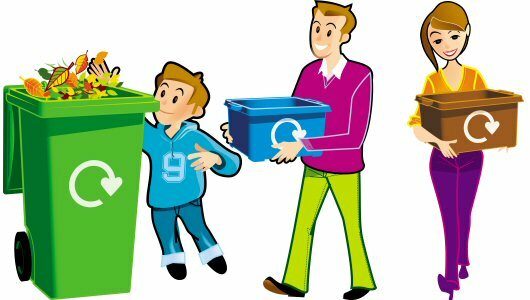 This is the time to review what is in the sorter, do your filing into your real files, toss out expired, and make a list of actions left to do. Having this time weekly means you are up to date on your papers. Now the bonus! Give yourself a reward for your hard work! That can include a walk, bubble bath, time at Starbucks or Jamba Juice, or your choice. Working with paper is not for sissies! What is your best tip for staying on top of paper? https://professional-organizer.com/WordPress/wp-content/uploads/2016/07/logo.png 0 0 Ellen https://professional-organizer.com/WordPress/wp-content/uploads/2016/07/logo.png Ellen2011-08-31 19:47:492011-08-31 19:47:49Staying on top of the paper tsunami! The start of a new school year means everyone working together for their best year yet! Each family member helping makes all the difference. Remember, Together We Achieve More! Family teamwork brings everyone together, helping and sharing responsibilities. Start homework time at the same time for all your kids. This way all the distractions of television, texting and more are all stopped simultaneously. Host your family meeting and create a community chart for your family. Across the top are the days of the week, down the side are the family member’s names. In the grid are the daily responsibilities of each person. Post the chart in the kitchen where everyone can see it. Create partnerships to complete family responsibilities. Partner with unusual pairs, such as dad/daughter, mom/son and mix it up! That way everyone shares the job and the joy of kitchen cleaning, toilets and laundry. Have a “Power Hour” once a week for cleaning the whole house. Discuss what needs to be cleaned and what the finished job looks like. Then set the timer and go! Develop your core in your family team. Set aside times for family members to have one on one times for fun, such as date night for mom and dad or a special trip for a parent and child to share. Post a list of family fun for everyone including movies to rent, places to go eat, or family activities. These incentives help everyone do their best on their responsibilities. What team activities work at your home? Gather your family for the family meeting. Share with them a project you have in mind. Ask how each can contribute to the project using what they do best. Gather your friends together to support a cause. Ask each of them to bring a friend to the meeting. Gather your co-workers and find ways to support each other in having power periods. Find a way that each team member can have an undistracted time to get their heavy duty work one. Gather your faith family together to support those in need around you with child care or healthy meals. Gather your grandkids and have a no technology day, learning how to use a yo yo or play jacks. Your grandkids learn and connect with you regularly, creating an extended support for them. Gather your family together for a power hour to get house cleaning knocked out. Who can you gather together to get more done and have more fun? Back to school means getting back into schedules, activities and getting to school on time. It is hard to do, especially after summer. One of the most important parts of back to school is getting back or getting going on good routines. Routines are the consistent, every day ways of getting things done that make life easier. Try out these routines this fall, starting them the third week of August, so that by the first day of school you are already in the groove. Have a set schedule for homework and other chores. Designate a little time for down time, and then start on homework in the late afternoon. The later you start homework, the longer it takes. Decide on what chores are done on what days and post a chart so everyone is on board with this plan. Use power periods to get homework done. Instead of 2 hours straight, break your homework time into 15,30 or 45 minutes of work and 5 minutes of walking around, getting a drink,texting friends or taking a very short break. Your kids will be more efficient if they know that the homework needs to be done in 45 minutes. All kids and parents need planners and calendars. Host a family meeting each week to write in on a month at a glance calendar what upcoming and regular events are going on. Include even the weekly activities, like ballet, football or other kids and parent activities. You can use the google calendar or Cozi.com if you are a techie, and print the calendar to post too. Kids bring their planners too to fill in so everyone is modeling and practicing how to use their planners. Set a bed time for the kids and parents. Well rested kids do better in school. Well rested parents are more productive. Set alarm clocks for everyone to get up and get going. Take a good look at the big picture and what you want this year to be for your family. At your family meeting, have everyone talk about this and share. Also think through over scheduling. Be realistic about what your kids participate in and your commitment. Being involved is a positive, but being over involved can cause stress and frustration. 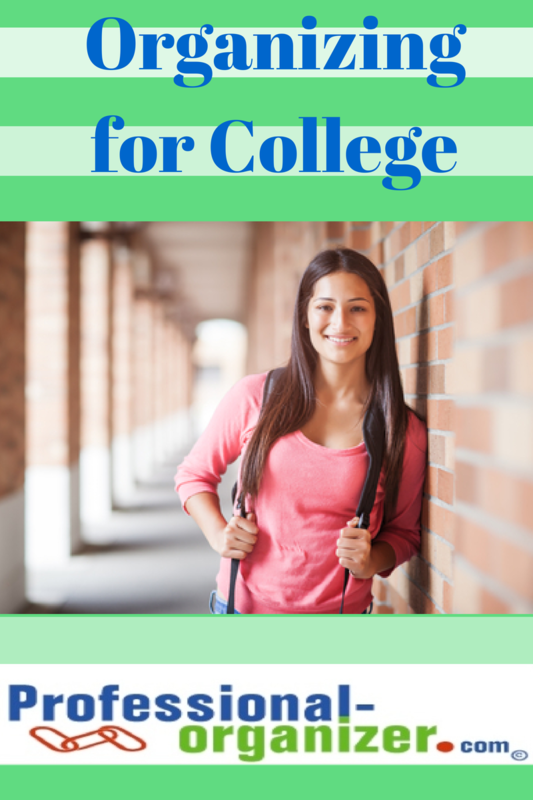 Its time to send your baby off to college, and there is a lot of preparation to do! Not only will they be working on academics, they will be working on real life! Your kid may be ready to fly the coop, and you are not sure they are as prepared as you might like. Having an organized approach will make for an A+ transition! 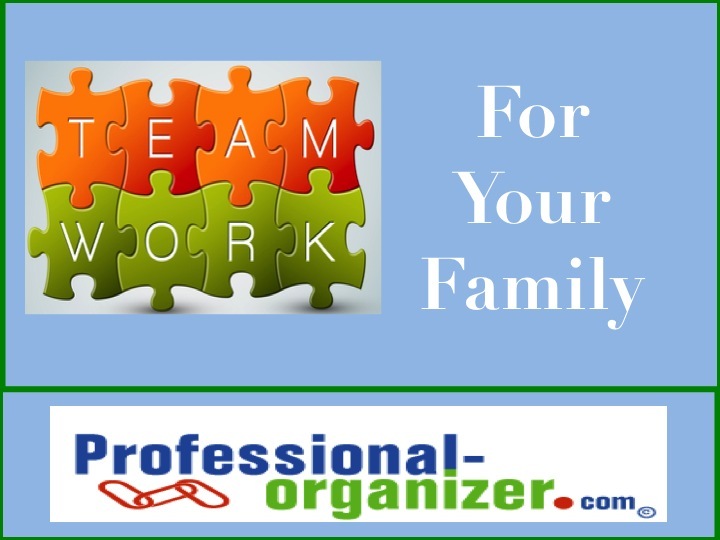 Organizing for college is a collaboration with your child. Talk through the college day with your student. No longer will they be going to one spot all day long. What will their day be like? Help them write up a schedule that will work for them, taking into account their class times, and their high energy times. Help them set up a planner that will work for them. Getting started in college is where real life time management begins. Having a great week at a glance planner in paper or technology will be the first step in making real decisions about their time, their priorities and their schedules. Record all the day’s details in their planner so they can see just how busy they are. Using their phone is a great option since it is with them all the time, they can set reminders and recurring events, and they can check it whenever and wherever. You can also recommended a toodledoo or notes for reminders on tasks. Paper is a reality for college kids. Help them set up a small filing system in a file box for their important papers such as enrollment documents. Encourage them to pay bills online and use ways to eliminate paper as much as possible. For their class notes and more, what will work best for them? Spiral notebooks, pads, or ??? As long as their system works, that is what is most important. The realities of dorm living mean two kids in a space about the same size as their bathroom at home. Consolidating, communicating and coordinating are key components to getting along in a small space. Encourage your student to do all of these in a positive, open and honest way for sharing a living space. Storage is always at a premium. Look for creative ways to maximize the space you have and use labeled uniform bins to store less frequently used items. Encourage your kids to rely on their strengths and core values. They are entering a time when there is a lot of new information and lots to think about. When they rely on their true strengths, they are most comfortable with their decisions. Core values like tenacity, honesty, creativity, and determination all make for college success. Keep communication going with the home front. Our kids will “fondly” remember that Sunday was the day to call home! Having one day to be sure to touch base, even in this time of texting, makes it a little easier on everyone. Parents can forever seem like worriers, but encourage them to keep safety in mind. Have a flashlight, jumper cables and a real first aid kit in their car. Just in case! How is your organizing coming for your best college year yet?